Internationally, American foulbrood (AFB) is the most serious, contagious bacterial disease of honeybee brood. It is caused by a virulent spore-forming bacterium, Paenibacillus larvae subsp. larvae. AFB can appear and spread quickly through a colony. If left untreated it can kill the colony very quickly. You can very quickly and easily test for AFB with the Vita AFB Test Kit. Signs of AFB infection can appear at any time of year. It is vital to detect AFB as early as possible. 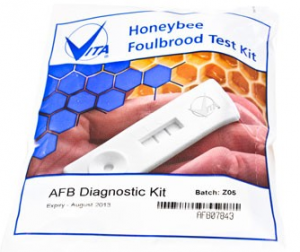 Vita has developed a quick and effective Vita Diagnostic Test Kit for beekeepers to test for AFB (and EFB) easily and quickly. The test can be carried out beside the hive and the results are available immediately. The brood pattern of AFB-affected colonies can appear very patchy and irregular, and this is sometimes called a “pepper-pot” pattern. This pattern occurs because the queen will not lay eggs in cells contaminated with AFB, so brood then becomes scattered sparsely over the combs in the remaining “clean” cells. Cell cappings may be dark and greasy-looking, sometimes sunken and perforated where the housecleaning bees have attempted to open them. In severe infections the colony has a foul, rotten odour (hence the name ‘foulbrood’). Bee larvae infected with AFB die in the late larval stage with the body stretched out. As the cadaver decays (eventually drying to a dark sticky “scale” which is difficult for the housecleaning bees to remove), it becomes gelatinous. If the cadaver is probed with a matchstick or something similar, the body can be “roped-out” – a key diagnostic symptom of AFB. Like many other disorders, AFB disease is exacerbated by stress brought on by a lack of food, water, space or attack by another disease or pest. The P. larvae subsp. larvae forms spores that are resistant to desiccation and to antibiotic treatment. Each scale resulting from AFB infection will yield millions of infective spores. These spores may remain dormant for many years and even decades on hive and beekeeping equipment and in honey or wax. Young bee larvae can become infected by spores which are already in the cell, by housecleaning bees or through contaminated brood food. Once inside the larval gut the spores germinate and the bacteria multiply rapidly, moving from the gut into the surrounding tissues of the bee. Infected larvae die within a few days, usually after the cells have been capped. The cadaver dries to form an infectious “scale” in the bottom or on the side of the cell. Untreated, AFB will spread rapidly through a colony killing much of the bee brood. At the end of a season this often results in small, weak populations that may not survive the winter. AFB spores also spread easily to other colonies by flying bees or accidentally by beekeepers. Towards the end of the season, AFB can be spread by robbing: weak, infected colonies are robbed by bees from stronger, healthier hives. Swarms from infected colonies may also transport the disease to new areas. There is no known effective cure for AFB, but good beekeeping practice and vigilance can reduce the risks. The Vita AFB Diagnostic Test Kit can give an early warning of the disease. Good beekeeping will help reduce other stresses on the honeybee colony and possibly prevent or limit the extent of any AFB infection. 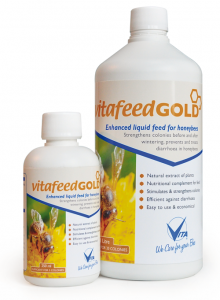 Vita Feed Gold can help keep your bees healthy and reduce stresses on honeybees, thereby making them more resilient to attacks by disease. Good hygiene by beekeepers will also reduce the risks of spreading the spores on tools or hive parts. In some countries, such as UK and New Zealand, AFB-infected colonies and hives must be destroyed by burning. In the UK, this has reduced the incidence of AFB dramatically. In many other countries, the antibiotic oxytetracycline (also known as terramycin) is permitted as a preventative as well as a curative treatment. However, P. larvae spores can survive the antibiotic and spores can survive on combs, on bees, in honey and on any associated beekeeping equipment to re-infect sometime in the future. In North and South America, bee colonies are often treated routinely with oxytetracycline, whether the colonies appear to be infected or not. However this approach costs beekeepers money, may leave residues in the hive and encourages oxytetracycline-resistant bacteria.